This is a reminiscence recorded by Betty McCann-Thomas describing her work at North American Aviation during World War II. 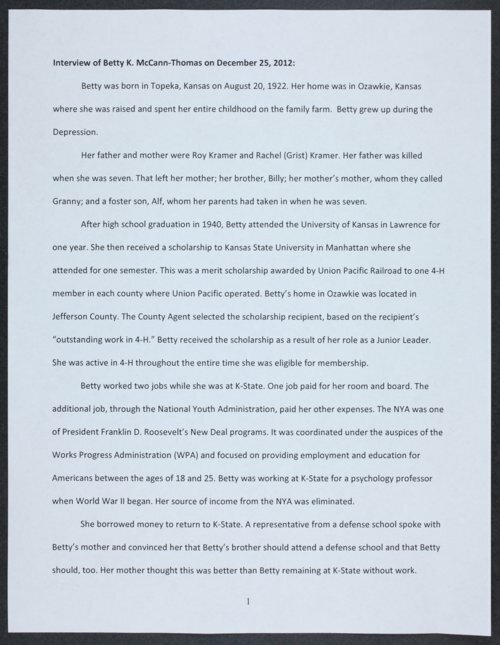 After leaving Kansas State University, she attended training school and was hired by North American located in the Fairfax District of Kansas City, Kansas. McCann-Thomas was involved in making B-25 airplanes. Women working in the defense factories were often called Rosie the Riveter. She describes in detail the tools she used and the work she performed on the airplane skins and tank doors. The collection contains two photographs of Betty McCann-Thomas.